+THe first thing I did. I wrote "peopletocr" according to my solution "clean"
.....but in the kryptos text K4 may be some cryptographic mistake voluntary or involuntary (or the web site is broken). + My solution is "Clean" because is an excerpt from Reagan's speech in Berlin, and has no misspellings because it has not been decrypted or encrypted, only deducted. + Now i search for a mathematical or expert in cryptology to verify my theory. This would be the final solution but this challenge has no rules. + Jim Gillogly, a Southern California computer scientist, who resolved k1, k2, and k3 said "There were no written rules in this contest", and adding: "As far as I'm concerned a crack is where you find it. The choice of tool isn't the important part, but rather the decisions about how to use the tools." I continue looking to verify this solution. Sanborn set up the website kryptosclue.com back in 2010 so people could submit the first 10 characters of their proposed solutions. That website does not appear to be online anymore. It expired on November 15, and he forgot (or chose not) to renew it. Jim Sanborn has chosen to take the kryptosclue.com site down. + This is the official version: He was getting way too many "junk" entries, and he just got tired of it. He is working on a new method for people to submit potential answers. Is this true or is it an excuse? So, this is solved? who knows. The website is down because the sculptor wants money, fifty dollars for response. He did not renew the KryptosClues.com website when it was due to expire about a year ago, but nothing was mentioned on google since then until now. The only reference I could find on Google was dated within the past month, archive.org doesn't have anything before today. And as of September 13, 2014, there was no mention on his website of this. And his PDF file was dated November 21, 2014. He has just changed his website layout and taken the opportunity to create a pdf file but the fee structure has been in place for the last 2 years, supposedly. If he was looking to either cut down on the E-mails (direct or from thenow-defunct KryptosClue.com), or to make money, I'm sure he would know to publicize it. If anyone else has seen a public reference to the $50 Western Union deal before , please speak up. And so ends the mystery of the missing website. At the same time as the main sculpture was installed, sculptor Jim Sanborn also placed several other pieces around CIA grounds, such as several large granite slabs with sandwiched copper sheets outside the entrance to the New Headquarters Building. Several morse code messages are engraved in the copper, and one of the slabs has an engraved compass rose and a lodestone. Other elements of Sanborn's installation include a landscaped area, a duck pond, a reflecting pool, and several other seemingly unmarked slabs. The World Clock "Urania" located on the famous Alexanderplatz is one of the most visited places of cosmopolitan Berlin. Located in the city center and meeting point for tourists, friends, lovers or protesters, is as popular as Alex itself. The structure of cement and aluminum measuring total 10 meters high. The lower column measuring 2.7 meters and has a width of 1.5 meters. It stands on a compass rose shaped stone mosaic (shown in the picture, notice his base of the spine). I have not visited Berlin and I have no better picture. Is it true that there is a compass Rose? To search where is the x, or in this case looking where is the compass rose. In answer to Joseph from Spain's post above, no I've never been to Berlin. I never cease to be intrigued at your deductive and non-mathematical/brute-force methodology. I call this looking for "data exhaust" and I generally require analytics tools to get even this far. Keep it up. And great to hear from you. "The Clock of Flowing Time"
+ After the Second World War the leadership of the German Democratic Republic decide for an extensive renovation work at Alexanderplatz. Various competitions had been set for the rearrangement of the place. The designer Erich John won the competition for the redesign of the Urania column with his idea of the world clock. 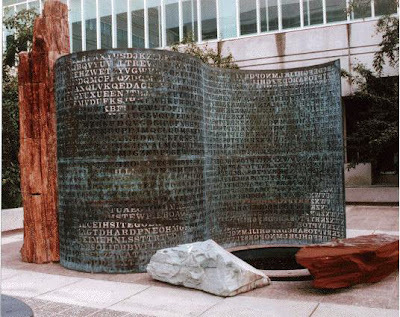 Thus themes in his work have included "making the invisible visible", with many sculptures focusing on topics such as magnetism, the coriolis effect, secret messages, and mysteries of atomic reactions. Now I must translate this into a cryptographic solution. Wadsworth's system involved a set of two disks, one inside the other, where the outer disk had the 26 letters of the alphabet (and the numbers 2-8 or incorporating any changes), and the inner disk had only the 26 letters. The disks were geared together at a ratio of 26:33. To encipher a message, the inner disk was turned until the desired letter was at the top position, with the number of turns required for the result transmitted as ciphertext. Due to the gearing, a ciphertext substitution for a character did not repeat until all 33 characters for the plaintext letter had been used. The importance of this system is that each of the words of the message influences the way in which the following, a property very interesting is encrypted and using modern ciphers.